The current insulin dose should be continued accutane online prescription upon initiation of.. I know we’ve been incommunicado for over a year now, but it’s because we’ve been crazy busy planning for an addition to the Old Man along with a restoration of the existing part of the house (consisting mainly of fixing the plaster and stripping/refinishing the woodwork). Well, we actually started work in the beginning of July after spending a year working with our architect on the exact plans of the addition (featuring a big new kitchen!). Anyway, we probably spent the most time trying to find the right contractor after reading the horrifying saga that the folks over at Casa Decrepit had with Willson/Bailey. We were scared to death to wind up with another Scott Bailey! Well, we think we found the right contractor and now we’re about six weeks in and couldn’t be happier with how things are going. I’ll likely publish the occasional picture here of what’s going on, but don’t have time to blog a whole lot as we need to strip the woodwork! We decided to go with Nex Flooring to refinish our floors, and they’re coming tomorrow at 8:00AM to start work. Nex Flooring is a family business run by a father and his two sons, and they got fantastic reviews on a local referral service, and their estimate seemed extremely reasonable. Before we get to redoing the floors though, a few words about the floors as they stand right now. The downstairs wood floors were covered in carpet for an unknown duration of time, along with a runner up the center of the stairs–this travesty in all likelihood saved the floors a helluvalot of wear and tear, so it’s not All Bad. 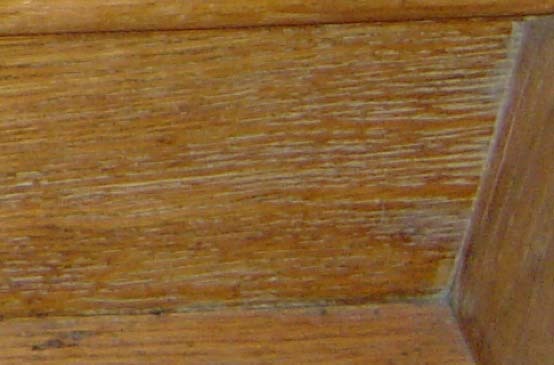 The wood floors throughout the house are red oak (except the kitchen, which is maple), and considering that the house is 92 years old, they’re remarkably level and even, although they do squeak a bit. 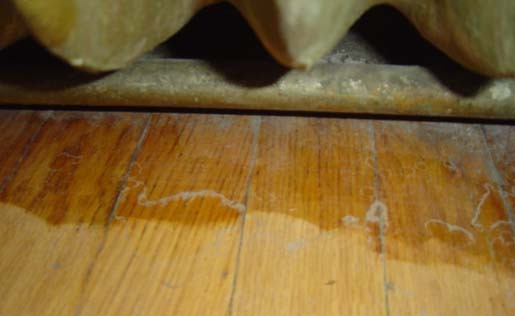 It appears that the previous owner pulled up the carpet and had all the wood floors refinished about four years ago, but I’m hoping that he didn’t pay very much as the refinishers did a horrible job. First: They didn’t bother to sand all the way around the radiators, they didn’t sand all the old finish off in some places, they attempted to rectify some squeaks by pounding 8d nails into a bunch of boards, and they did a real half-assed job on the stairs (esp. the risers). 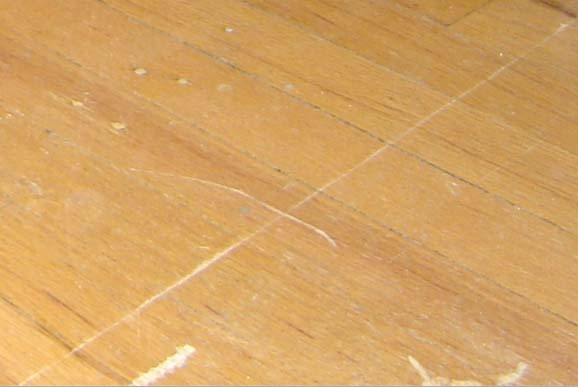 Lastly, they didn’t bother to pull up the quarter-round (aka “the shoe”) between the baseboard and the floor, despite the fact that a) it was pulling away from the floors in some places, b) the floor under the shoe was dark dark dark, and c) it looked like crap with a dark line running under the shoe around the room. 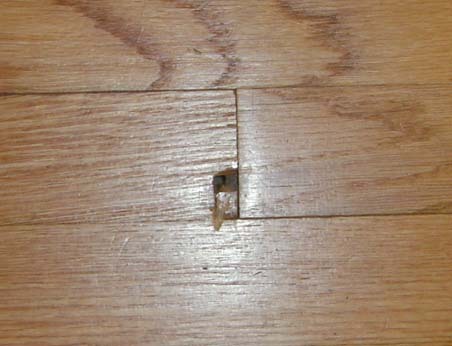 They repaired a hole in the middle of the foyer by gluing in a small divot of wood (which popped out shortly thereafter, I can only imagine). The bullnose ledge leading to the basement looked like a dog had chewed half of it off. Lastly, it looked like the floor had been stained in some areas and not at all in others–the master bedroom floors looked positively white while the rest of the floors were just light. Add to that the fact that the house was rented out for the last few years, and you wind up with some pretty darned trashed floors. The northwest bedroom was gouged so badly that it looks like someone had been dragging boat anchors around in there. So in preparation for the Floor Guys coming tomorrow, I pulled all of the quarter-round up in all of the rooms where we’re going to be having the floors refinished (which comes down to every room except the kitchen and the sun room). They offered to do this, but I figured that it was a good way to get to know the house and how it all goes together. In the process of doing this, I discovered that the northwest bedroom appears to have had a fair amount of its oak trim replaced at some point–with pine trim. And for an encore, pulling the quarter round off in some areas really highlighted just how badly the previous refinishers had gouged the floor in some places. Think I’m exaggerating? See for yourself. Home Depot sent a Door Installer over to look at our door and determine how much installation’s going to cost. It turns out that the cost to install a $150 door and a $79 screen door in our non-standard breakfast room is $680 worth of labor. Ahem, no. I’ll be installing that myself (maybe with the help of a friend). The lesson here is: If your current door and wall are not the *exact* height, width, and depth of a standard pre-hung door, you’re a prime candidate for fleecing. Lastly, The Cleaning Company came by to give us an estimate for cleaning the house top to bottom, and they charge an hourly rate, so no worries there–we know the house is filthy. The Second Refinishing Guy came by today to give me an estimate for stripping and refinishing the woodwork. He noticed something that I had never noticed: Almost all the woodwork was caulked to the plaster. Yes, you heard me. Almost all of the woodwork. Caulked. To the plaster. Now when I was in the back closet in the basement, I noticed a half dozen tubes of DAP ALEX Painters Caulk, and I couldn’t figure out what the previous owner had been using it for. Stripping the woodwork is going to be just that much more fun. On a side note, Second Refinishing Guy suspects that the wood panelling in upstairs foyer and on the staircase isn’t original. I suspect he may be right as it seems to have been installed on top of plaster as it’s almost flush with the other trim. The doorbell was, not surprisingly, non-functional, and while the chime mechanism is hanging in the foyer, the chimes were nowhere to be found. We managed to find the one wireless doorbell that has actual chimes, so our doorbell doesn’t sound like the door chime at the dollar store. We picked up a few cheap lamps and put them on timers to give the place at least a slight look of occupation until we can get moved in. Then the Second Floor Guy came with his four-year-old son to give us an estimate. Second Floor Guy was very nice, and his son was kind enough to dust off our steps and half of our living room by crawling and sliding around playing with a toy. 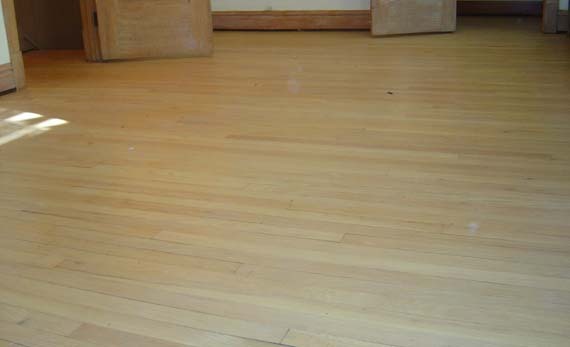 Suffice to say that the floors are filthy–the house has been empty for months. M. and I went down into the basement and spent about 45 minutes pulling the remaining ceiling tiles and furring strips down off the ceiling. M. got all the tiles down from the front half of the basement and I got a few dozen furring strips yanked. I’m glad to have gotten started on that. Later, the Refinishing Guy came over to give us an estimate on refinishing all the woodwork. Refinishing Guy was very nice, but I can already see getting the woodwork refinished is going to be a lot of money. After living in a condo for three years, my wife and I bought our first house today. When we went over for the walkthrough, we found an electrician in the backyard, digging a trench to run a new line out to the garage, which had shorted out (again) the night before. “Jeff” assured us that he’d be all finished by the time we got back from the closing. So off to the 1:00 closing, which turned out to be in the back room of a local law office which was already in the back room of a local insurance office. Coincidentally, the back room in question was a mere five feet behind the back wall of the deli of our favorite local grocery store. It was just that kind of place. Anyway, our attorney was late, then the bank took forever to put the loan through and we didn’t get out of there until 10 to 4. We grabbed some sandwich fixins from the deli next door and headed back to the house to eat and wander around the house enjoying our new purchase and waiting to get an estimate on refinishing our floors. The “Floor Guys” were a father and son team, and couldn’t have been any nicer… there’s a very good chance we’ll go with them. You are currently browsing the archives for the Contractors category.